Electronic equipment runs hot and quickly produces an excess of hot air which can be harmful to sensitive electronic components. Maintaining a cool temperature is vital to prevent equipment from automatically shutting down due to overheating. OceanAire portable air conditioners come with heavy duty casters to allow for mobility. They can be easily wheeled into place to cool any room in minutes, and can also be effortlessly stored. 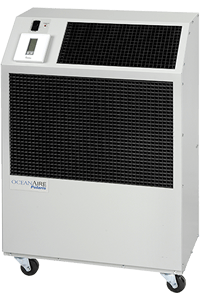 OceanAire portable A/C units are renowned for providing quiet and efficient cooling in data centers. Our team has extensive experience in building precision portable air conditioner units and our entire range of products is built in the USA to provide many years of dependable service. The Oceanaire PWC series are portable water-cooled air conditioner designed for permanent or temporary spot cooling applications. The entire air conditioning unit has been built in an attractive sheet metal cabinet, equipped with heavy-duty casters for mobility. All PWC models come with a 10-foot power cord for electrical connection and added mobility in service.